I guess I knew that this day was coming, eventually, but it just seemed that this quilt did so well everywhere it went. So I kept sending it to shows. 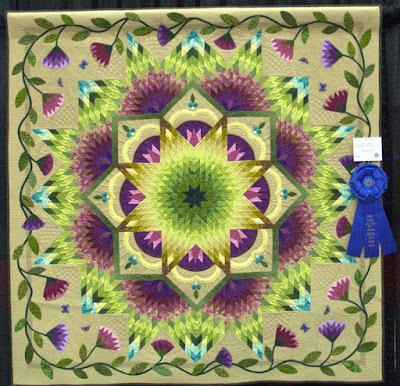 This weekend, it is at the Jax Quiltfest in Florida, and is wearing it's last ribbons - a Best of Show, no less! Talk about a happy note to go into retirement on. Now, the Jax show has been more of a regional show, and some do ask me why I have entered it the last few years. I have a client who lives out of the country, and she visits family there, and enters her quilts there. We thought she was going to be there, along with several of the quilts I did for her last year, but her plans changed. I had still entered this though. In addition, I lived in Jacksonville twice as a kid, even graduated from high school there. It is my old stomping ground. I was told that there was a lot of competition there -- 500 competition quilts. The photos shown on Facebook really show the level upped this year. Zen was lucky to win. Four years after she was completed, she still hangs nicely. I only have a few pictures of the construction of this quilt, unfortunately. I made it in early 2011, and started the quilting in the fall of 2011. When I think back on that, I had only had my longarm two years when I did this quilting. 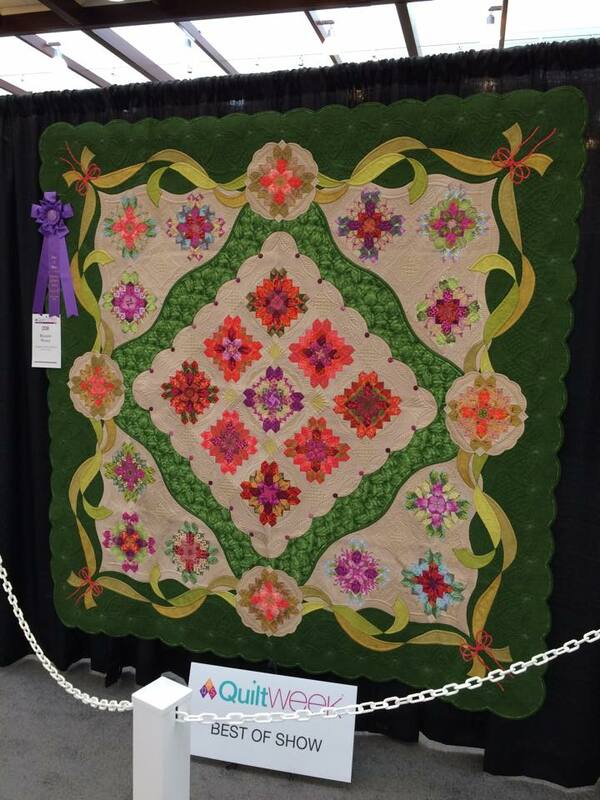 It is pretty amazing that this quilting still holds up in competition today! 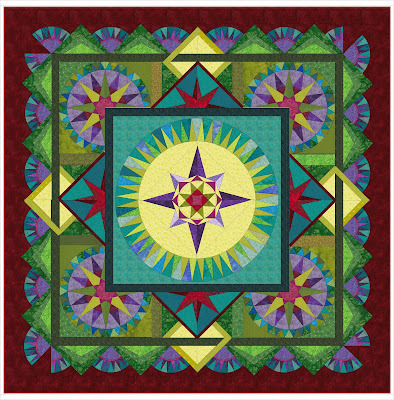 Here is a little graphic I did using scrapbooking software, when I was trying to design this quilt. I didn't yet have EQ7! This quilt top was made exclusively with fabrics I had in my stash. I was in my "poor" days...my business wasn't booming, and I wasn't surviving on my show wins! I had kids at home still (not in school that is), yet I had quite a pretty stash. I had seen this cool strip-piecing technique somewhere to make this carpenter's star, except that I didn't want 10" plain setting squares. At that time, that was WAY too much plain fabric for me to mess up quilting!! That is the reason that they were designed to have applique. That is apparently the extent of the photos I have of this quilt's construction!...I don't have anything from when I designed the quilting, but I know that it was not nearly as overthought as quilts I make to day. In fact...the flowers that were appliqued around the border of Zen Garden were mostly from leftover fabric from when I made the star. I had made a couple of strip sets that I didn't really like. These went into the flowers. I also made some which were a little smaller. This quilt had the most hideous tan solid as a background. I stuck true to my intentions of not buying any fabric for the top. Because I hated this tan so much, I covered it up with the applique! This next photo dates the quilt for me. I know that this is taken about the time my daughter Sophie started kindergarten -- 4 years ago! She was my little fabric helper, even then! The quilt was off of the frame, but is obviously not quite finished. 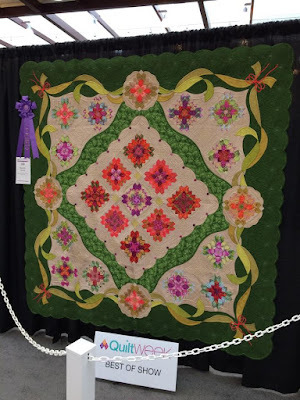 There is no quilting on the flowers. Many of the photos I have here show the quilt almost done. I know that there was a little more detail stitching done, but you get the idea. The colors of the quilt are very vibrant, and just sing to me. 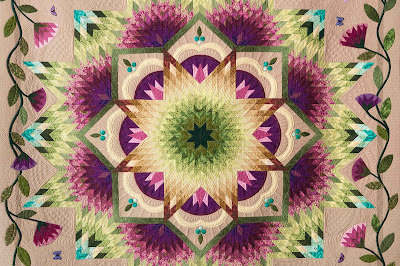 I often referred to it as a "blooming" carpenter's star because the fabrics allowed the floral materials to bloom. It was one of my small victories when I decided to add these butterflies. They were fussy cut from another fabric, and I colored them the color I wanted them to be with Sharpie pens. The garden just needed butterflies. The quilt has a layer of Hobbs 80/20 and a layer of wool batting. I stitched using mostly Invisifil thread -- a first for me. The solid tan left such incredible texture with this nice fine thread. I was infatuated at the time with using McTavishing with pebbles. The colorplay on this quilt was so great -- I don't know if I have or if I ever will combine colors and fabrics so effortlessly, and so beautifully. Seriously, I can't wait for this quilt to come home so I can hang it in my home. This next photo shows the center in it's finished state -- There were a few more echo lines added on the applique from pictures I showed earlier. And a piped binding. This one was done twice. The first binding didn't lay flat. It was ripped off, and redone in the dark green. Seems to be a common trend in my quilting!! This is actually a professional photo Jeffrey Lomicka took...prepping the quilt to be in a magazine. That notion seemed so foreign to me then, so unattainable. It was mind-blowing to think that Zen Garden was going on a magazine cover! 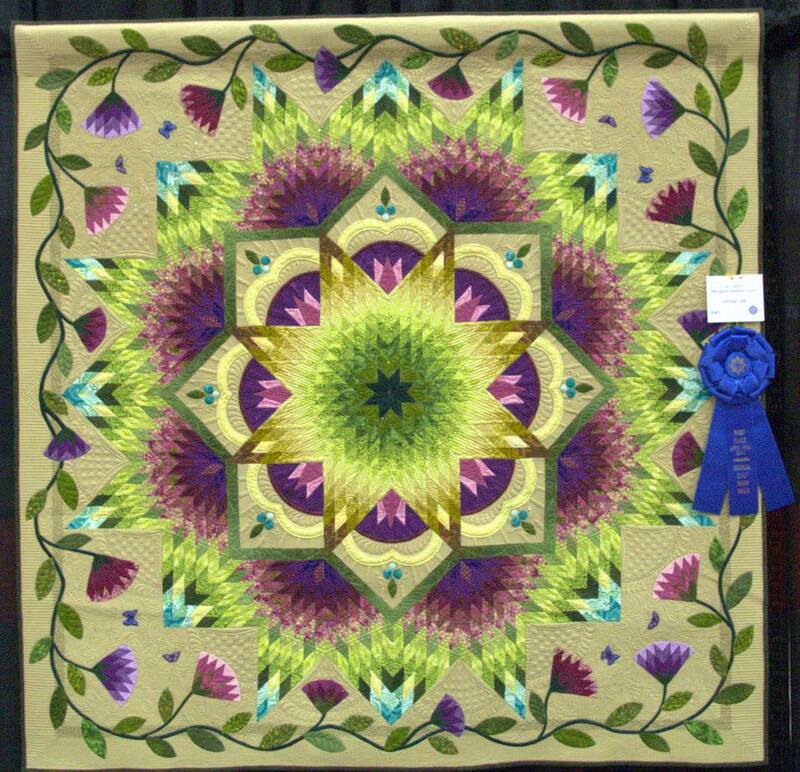 I sent this quilt to many shows over it's 4-yr show life. It started out at MQX in 2012, earning an Honorable Mention in very stiff competition. But the big event for that year was that Zen got accepted at Paducah. This was HUGE for me. The quilt I tried to get in the previous year was not accepted. But in 2012, I got two quilts in. I made plans and went to the show. Zen earned an honorable mention at Paducah - I was over the moon! This was a huge show with many, many great quilters! Images of my quilt were appearing in other places too. The Vermont Quilt show chose to use it as the cover for their class brochure for their show. It had been at the VQF show in 2012. In July 2013, the MQU mag sported Zen Garden on the cover. 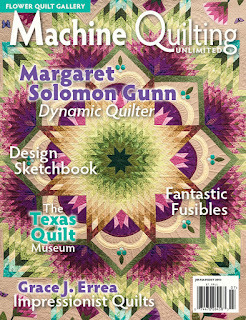 In fact, one of my Handi Quilter ads was on the back cover, so I joked that I was on both covers! 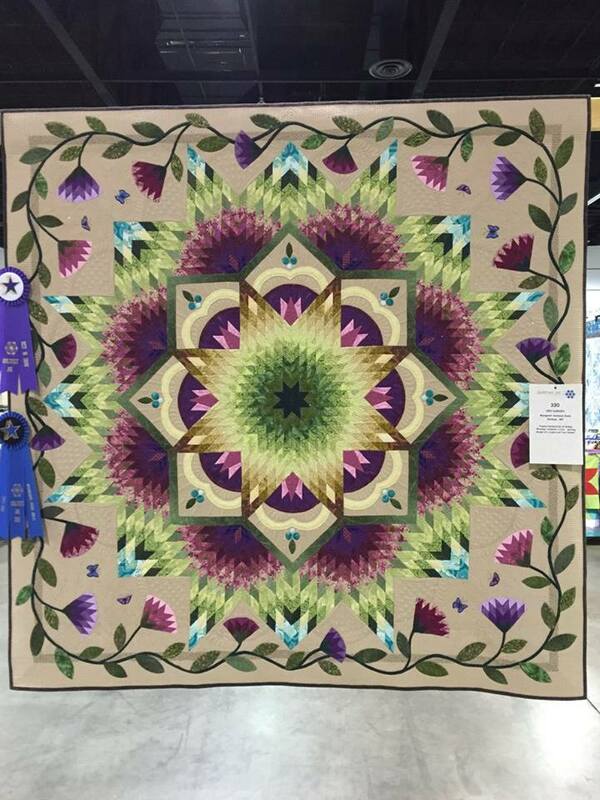 Later that summer, the quilt won the Best of Show at the Lowell Quilt Show. Many of you don't know of this show...it was in Lowell, MA and used to have a nice display of quilts. It draws viewers from my general area, so I was more than tickled to have calls from new clients because they saw my work in the show. 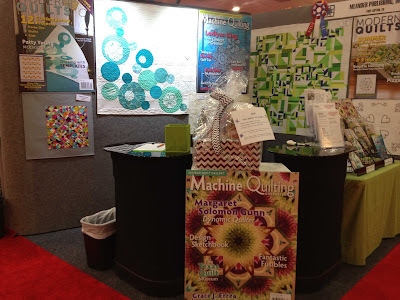 In the fall of 2013, Zen Garden was part of Meander Publishing's booth display at Houston. This was particularly fun because I worked in the booth several days, and got to see it and talk to other quilters about it. Sometime in 2013, AQS announced that they were modifying the rules to their shows, starting in 2014. Previously, you were only allowed to enter a quilt once if it happened to ribbon. This rule altered to read "if you did not win a cash award on a quilt in 2013, it could be entered starting in 2014 for a full 12 months". Zen did technically ribbon at Paducah in 2013, but there was no money, so for giggles I entered it at the 2014 Lancaster show (along with Big Bertha, which I actually had better expectations for). 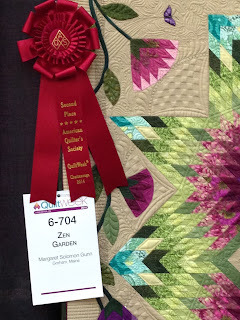 Both quilts did well, but I was blown away when Zen Garden won the Best Wall quilt at that show. This came with a huge check too! Sorry...this is sideways, but AQS got to publish photos of Zen Garden several times in 2014 because I entered it at 4 of their shows, and it ribboned at each of them! When I pieced and quilted this in my 2nd year of longarming, I never imagined where this quilt might go. AQS also used images of the quilt on luggage tags, which were sold at shows in 2014. Funny thing, about every quilt -- and Zen is no exception -- For every 5 good critiques of a quilt, there is bound to be one dud. One in particular sticks with me, even to this day. A couple of years ago it was at PIQF. It got a scathing review because the judges really disliked the crystals on it. This was finished in a time when I did like to use a few crystals. I knew it was not going on a bed because of its size. I saw no harm. Besides, the crystals were a size 6 -- very tiny! The quilt just twinkled under most show lights, and not like a Vegas billboard if you know what I mean. But all in all, the quilt was well received. This is a special day...It is Day #2 on Jackie Kunkel's Book Blog Hop tour. I am delighted to be here showing off her first book. 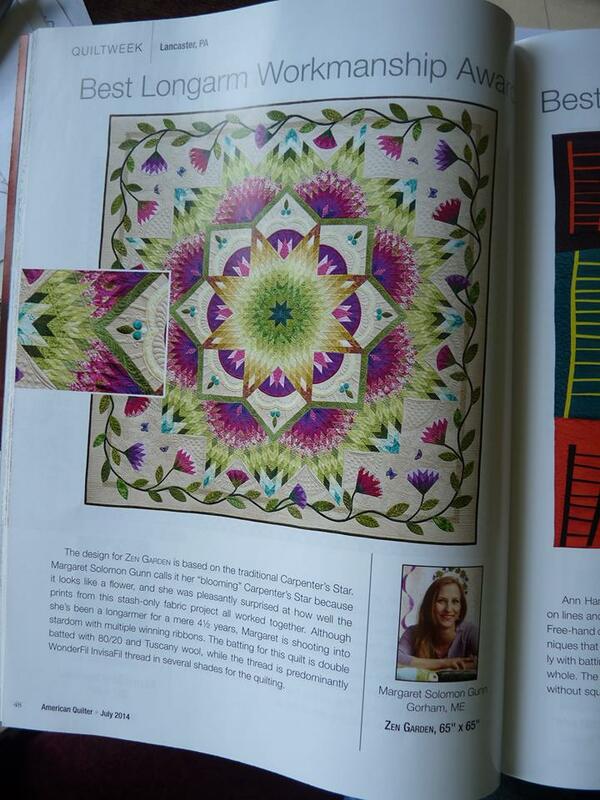 I am even more proud to have been asked to quilt five...yes 5 quilts in this book. 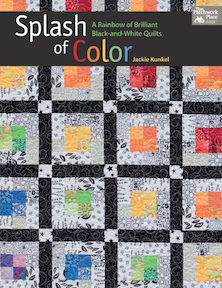 Jackie is a great lady, a fellow longarmer, and she has a fun book of quilts suited for all abilities which showcase fantastic black & white fabrics, coupled with bold colors. Who doesn't love those, I ask you?! She asked me to choose one of the quilts from the book and show my readers a few pictures. While I love many of them, Proud Mary is the one I chose. OK, I am partial to this quilt because I did quilt it, but it is also the only one of the 5 I quilted which is in solid fabrics. All of the custom quilting is not hiding in the print. Print is a double-edged sword...It is SO gorgeous and textural, but as a quilter it is challenging because we really want our quilted patterns to show. So, when it comes my time to make a few of the designs in Jackie's book, you know I will be pulling a few bold prints, but mostly the solids! This is a 60" lap quilt, but you could easily extend (or reduce) the size by making more of the 6" blocks. As an experienced piecer, I will say this for the benefit of those who see a curved seam and cringe. Curved seams at this size are a piece of cake - you can do it! The pops of color are cottons and batiks. I love the use of batiks with the black solids because the batiks just glow with color -- kind of like a piece of stained glass. My photos here show you what I did with the quilting. I used a single layer of wool batting. It has more loft, and especially with the prints, it helps the loft of the quilting to show through. I quilted this using a few shades of Glide 40wt polyester and YLI polished poly thread. These threads have a slight sheen, and give the surface of the quilt another dimension. Each quadrant of the circle received some more modern straight-line work, as well as hook feathers, which are not as traditional looking as the plain variety. Additionally, I chose an aqua thread for the black circles. White circles had plain old white thread. The quilting just shows that much more easily on the white. The background filler on the black is stitched in a deep plum thread. It shows best on one of the last photos. It is subtle, but pretty. 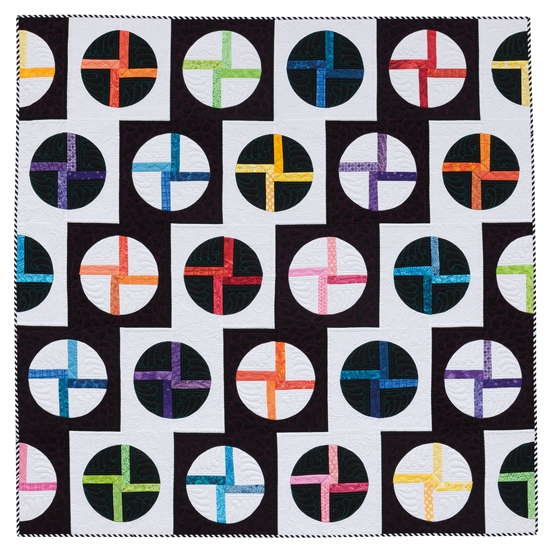 Within each colored crossing is a simple design intended to give the space texture and movement, and to break up the linearness of the cross. These are stitched in a multitude of matching colors. I will be doing a drawing on October 1st. If you are interested in winning an e-copy of Jackie's book, leave me a message. 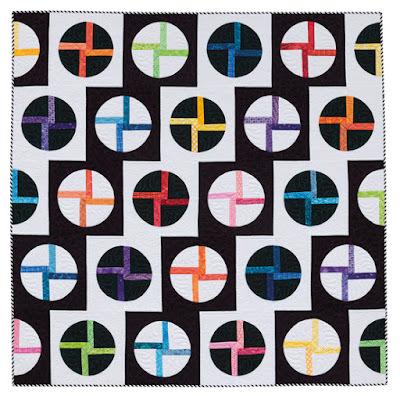 Tell me what fabrics you'd choose for the Proud Mary quilt. Jackie and I can't wait to give this copy of her book to one lucky winner. Alternatively, you can go to her website and order your own copy of the book! She also sells a wicked-fine assortment of the black & white prints, as well as the solids and batiks! NOTE: you must also leave an email address in the comment!! Here is the schedule for other bloggers who are participating in this Book Blog Hop. Be sure to go and visit each one! 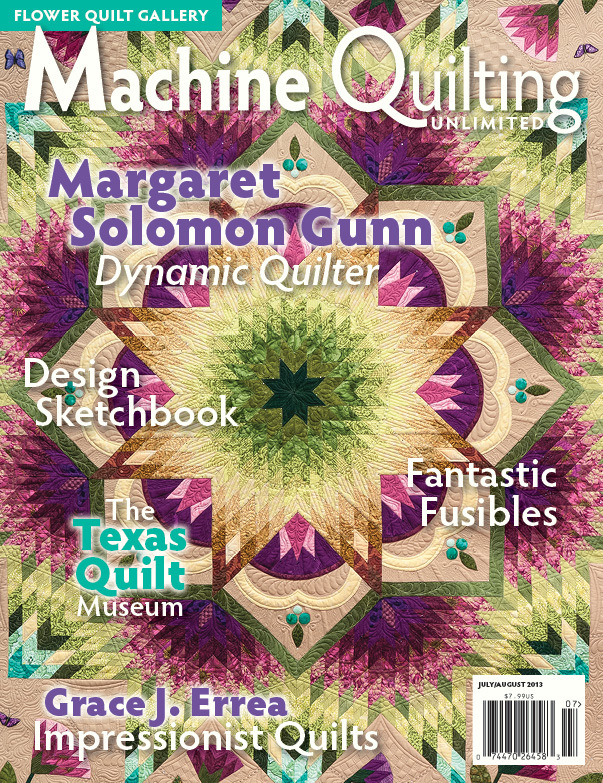 You are bound to get a good view at the quilts in this book (and they are all having give-aways too)! So it is that time...time to post some of the quilting work from the past couple of weeks. This is a 20" wall hanging from a local quilter. I realize that vertical seam looks bowed...yes, it is! It will clearly need a good blocking to straighten it out. I think that the green triangle must have been stretched when the pieced section was sewn on. It wasn't something that I could "just quilt out"! But, the piece is sweet. You don't have the benefit of seeing the pretty fabrics -- many of them have a gold leafing. The client requested that there were ginko leaves worked into the center filler, and to keep with an Asian theme. I added a wool batt to the very thin W&N that she brought. W&N just does not provide sufficient loft for an applique quilt. 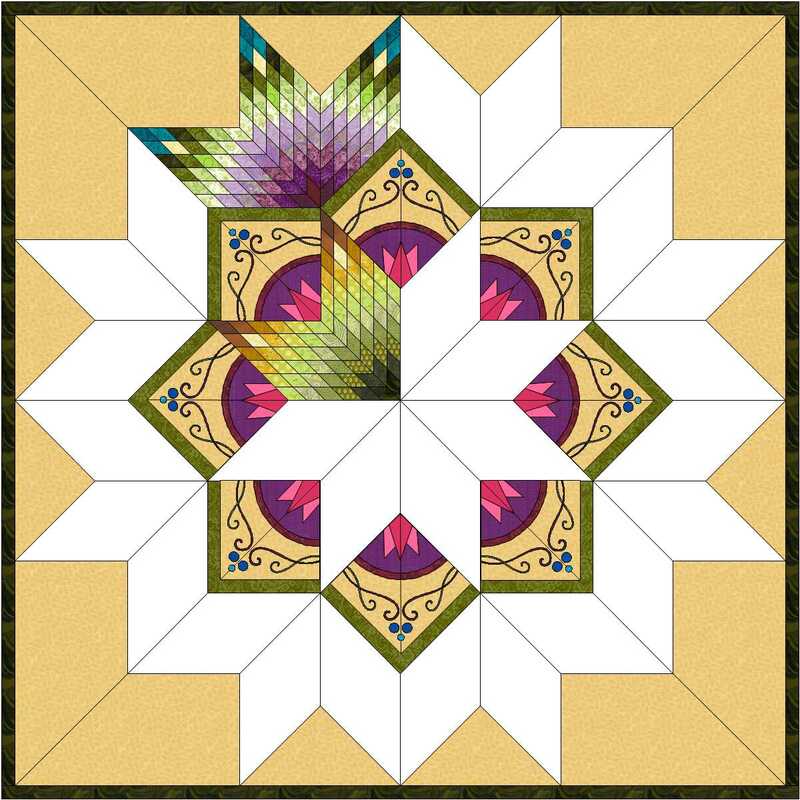 The center has the ginkos stitched with a 40wt Glide two times, and the background is then stitched with 100wt invisifil. Invisifil is not my favorite thread to sew with, but fortunately this was a small area. I'll tollerate 6 thread breaks, but no more! There are 1" clamshells on the side border, some of which have a stitched detail. The green just seemed to look thready with every idea I had, so I went with the simpler geometric design of sections of 1/4" lines. The same client also left another wall hanging, but of a completely different style. This is about 30x40 or so. The cats are a panel. The challenge of this piece is that it has dozens of flanges (all those grey-ish strips)! These were a bit of a pain, and even when they aren't, they have a tendency to want to not lay flat when the quilting is finished. She asked me to copy some of the graphic designs from the cats into the quilting. There were spiky shapes, swirls, and dots (pebbles). The cats are also outline stitched in clear thread. I stitched in several colors - trying to mostly coordinate the thread with the fabric. The next two quilts are from a semi-local (Mass) quilter. She has specific ideas for how she wants her quilts finished, so I just follow her directions. It more or less takes the challenge out of designing the quilting. One benefit is that she does not like dense quilting, so they don't take too long to quilt. This one was a little unorthadox in that the floral panel in the center is flannel, and the rest of the quilt is not, but it seemed to quilt up just fine. To keep it drapey, it has 2" clamshells in the heavier flannel section. I won't lie - it is hard for me to leave a quilt with such minimal quilting. It just goes against my aesthetic. This is just one client who I know wants them done that way. Here is another quilt I also did for her. It's basically almost the same type design. I changed it up a little so they weren't identical. She tells me...put lines here, put swirls and feathers here, put leaves here...sometimes it seems a little disjointed, but the end result is to her liking, so all is good. Here's last week's last quilt... It is a darling baby quilt for my Napa, CA client's daughter. I need to get it to the post office first thing tomorrow. It is much more modern than most of the quilts she sends me, so I went with the vibe. It's stitched in YLI polished poly and Glide threads. Only the outer borders are ditch stitched. For the chevrons, I chose to stitch parallel lines 1/4" from every seam for a change. She has machine embroidered animal faces and appliqued them into the cars! I chose a different filler (in blue and green threads) for every white space. It was fun, and I think that the end result is adorable. So, I am getting ready to load this quilt next week. I can't find a real pic of the quilt, so this is an EQ7 rendition, and it is pretty dang good at match on the colors. Several weeks/months ago I drafted up this "idea" for the quilting. I design my show quilts so many different ways. I have a Wacom Bamboo tablet for electronically drawing on photos of actual quilts, but at this moment, it is under a pile of stuff on my desk. This is a common theme in my life. Sometimes, the unsophisticated approach is simpler. It really all depends on the day. There are benefits to all my methods. So, I thought that I knew the major motifs that I would be using, which means that the next logical step is to mark the quilt. It has been ages since I have quilted a quilt with deeper colors and for lack of better name, obnoxious prints! I do this type of quilt weekly for clients, but not so often for myself. Don't get me wrong, I love the texture that prints bring to the quilt, but there are definite drawbacks when you actually want to transfer a design, and see it! I am posting this post because you won't believe the number of emails I receive asking me how I mark this and that. Do I free hand it all? Do I have a computer? Do I use a light box?...Well I have all but a computer, and these tools are helpful, but my biggest issue on this quilt (besides what in the world should I quilt) is how in in the world do I mark it so I can see it! Print and dark fabric are hard. This is kind of a no brainer, since the fabric is light. I used a water soluble blue pen. It is a judgement call if it is better to mark as you are quilting the quilt, or before you load it in this case. I find that if I can see the entire center medallion (it is 30"), it will yield a more symmetrical result. Besides, I wanted the radiating ray lines to be marked. Those are a total pain to do as you go and get them neat. I am battling time with my blue pens, as it is very humid here still, but I believe I will be ok. If not, something should be visible by the time I get to the center in a week! This is one of the squares of the same color fabric. I have chosen a rope template. I will fix up that corner when I get to it, and the quilting within this area will be free handed/unmarked. I like the rope as it kind of ties into the mariner's star theme. One of the harder areas to mark happened to be one of the easier areas for me to design. The green fabrics I chose have an illusion of being sort of solid, but in actuality, there is enough print to drive you blind! The "scrappy" green area surrounding the 4 corner stars has this swirly design which starts at each corner. Many of the green fabrics show the white SewLine pencil adequately, but some of them are down right difficult! I prefer to use something that I don't have to physically erase later, but that is not in the cards this time. The blue pens just DO NOT SHOW UP!! My hope is that this swirly, scrolly design will tie these areas to the similar design I used for the center nicely. That is the "plan" anyways. The outer red border is getting an insane but lovely stitching treatment. I want to sew this in a visible color thread, which complicated the design a bit (or slows me down !). I hoped for a design I could quilt without marking, but I opted for the overlapping look, and marking is really the only method. The quilt is destined to get a large scalloped edge. You know me by now -- I love curved edges! I marked it before quilting so I know where it is. I also marked off these wedge-shaped areas (template out of manila folder) because I plan to quilt them differently. Just so you know I am human, I can honestly say I don't know what the heck thread I will use on most of this. I have no clue what color, or what weight. I am anticipating picking stuff out if I don't get a plan fast. Dense fill work will be/should be stitched in fine thread, and I have silk thread in each major color of this quilt. Not sure if I have enough, but I have a cone! On the flipside, though, if you want to use thread to tweak the color of the background, silk is a hard and expensive way to do it. It is better to go with a heavier thread like 40wt. As you see above, I am still playing with the design of the green triangle units of the outer border. Just when I think I have a clue, I realize I have no idea what I am doing!! I got fantastic news from AQS earlier this week. 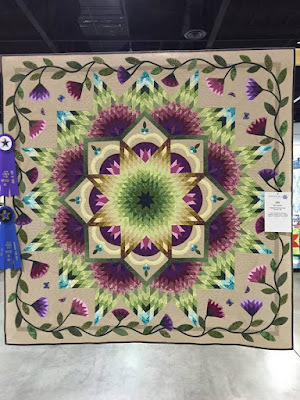 My Bouquet Royale quilt has won the Best of Show at their Chattanooga show! I an completely blown away. Surprise, shock, joy...every emotion. I really wish with all my being I could be there to see it and to talk to people at the show, but it is not in this weekend's cards. None the less, it is one heck of a grand paycheck for the week!